According to Weber, the rationalization of society led to the disenchantment of society and as a result religious motives for action were replaced by rational motives for action. This post considers arguments and evidence for and against this theory. However, with the Enlightenment and the Industrial revolution, the power of the of the church was increasingly questioned, and over a period of many years religious ways of thinking came to be replaced with more scientific or rational ways of thinking. Science and the scientific method became more central to social thought: knowledge was increasingly constructed through empirical, rational methods, rather than being dictated through religious channels. 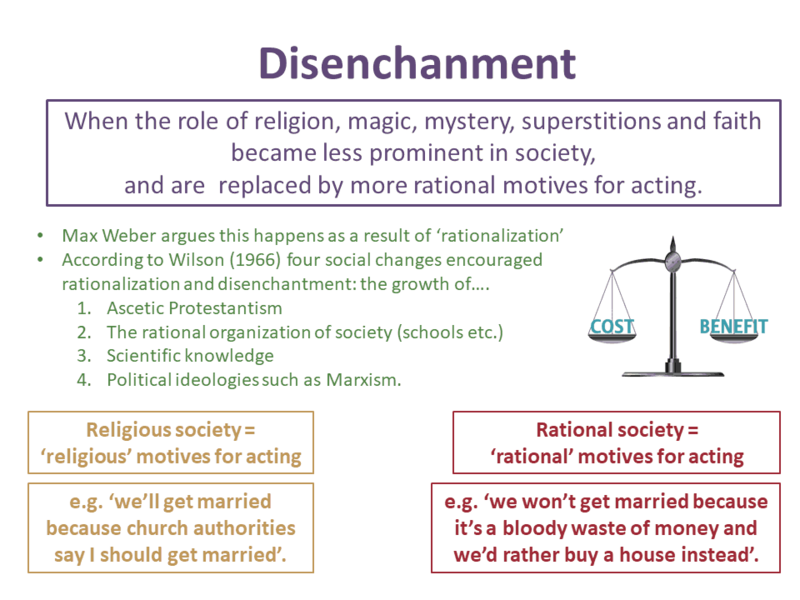 From the Enlightenment onward, society went through a process of ‘disenchantment’ – the role of religion, magic, mystery, superstitions and faith became less prominent, and replaced by more rational motives for acting: rather than acting because faith leaders or religious tradition dictated that you should act in certain ways, without thinking about it, people were increasingly free to act for themselves. People en mass started to think more about how they should act, what they should do, and the best way to achieve their goals. Ascetic Protestantism. Largely following the theory outlined by Weber in his Protestant Ethic and the Spirit of Capitalism, Wilson argued that protestant varieties of Christianity encouraged a rational approach to worshiping God – your ‘faith’ was essentially measured by your productivity. The rational organisation of society – the establishment of schools, workplaces, governments all imposed systematic ways of acting on people. A greater scientific knowledge of the social and natural world – Wilson argued that science provided more satisfactory explanations of many social and natural phenomenon than religions ones, and were better able to help people in tackling such problems. The development of rational ideologies – such as Marxism which offered more immediate solutions to our problems in this life further challenged and undermined religion. Wilson argued that the rational world view fundamentally undermined the religious worldview, because it was based on the principle of systematic procedures to assess ‘truth claims’, whereas religious knowledge could not be tested and verified. Steve Bruce has argued that although science and especially technology have challenged some religious beliefs, people may still turn to religion when technology fails. Postmodernists point out that some people are skeptical of the promises of science. In some ways, science has made the world a riskier place. The rise of the New Age Moveement and continued influence of the Christian Right in the USA show that religion is still important to many. Previous post: Is it OK to laugh at women who wear the burka? Next post: McDonald’s – Are they really offering their employees a better deal?